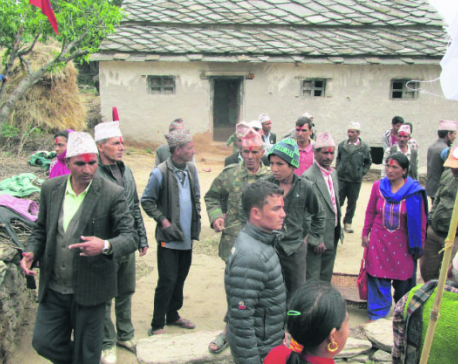 TIKAPUR, May 30: With the objective of garnering more votes, most of the political parties in Janaki Rural Municipality of Kailali are fielding Tharu candidates for chief as well as other posts for the second phase of local elections. There are altogether 27,507 voters in the rural municipality among which around 17,000 (62 percent) voters belong to the Tharu community. The number of other voters is 10,000 (38 percent). According to the political parties it would be convenient to pick a Tharu candidate as they are likely gain more support from the community. However, some locals have speculated that candidates from the hills community might ultimately win the election. According to them more Tharu candidates means the Tharu vote will be divided. During the Constituent Assembly (CA) of 2013, Phul Ram Chaudhary who had fought the elections on a UCPN (Maoist) ticket, lost the election. Now the party is fielding him as its candidate for the chief of the rural municipality. Chaudhary claimed that he has a good hold among the voters in the municipality and his victory is certain. He accuses other parties of discriminating against and disrespecting the Tharu community. Though CPN (Maoist Centre) has already been claiming that its candidates will win the rural municipality, CPN-UML here does not see the Maoist Center as its competitor. Jagat Bahadur Chaudhary, former chairperson of the then Durgauli VDC and a UML worker, has filed his candidacy for the chief of the rural municipality. According to him, his competition is with the Nepali Congress (NC) and Madhesi parties only. "We have a large number of voters so it's not hard for us to secure victory," he said. But for the post of vice-chairperson, CPN-UML has fielded a non-Tharu candidate. The party has picked Ganga Devi Thapa. Thapa has been associated with various social organizations since a long time. NC as forwarded the names of Ganga Devi Chaudhary for chief and Surya Bahadur Batala for deputy chief. Nepal Loktantrik Forum (NLF), which is considered as one of the strongest party in the district, has not yet fielded its candidates. As NLF has a good grip among the voters, there are several aspirants for chair and deputy chair. The party's grassroots units have recommended four candidates for the two posts -- Pradip Chaudhary, Parashu Chaudhary, Ram Prasad Chaudhary and Dinesh Chaudhary. Meanwhile, the Rastriya Prajatantra Party (RPP) has recommended Man Bahadur Chaudhary for the chief post and Parmarani Badayak for the post of vice-chair of the rural municipality. Likewise, Naya Shakti Nepal has picked Janak Chaudhary as its candidate for chief. With this, Rastriya Janamorcha has been the only party which has fielded candidate from a non-Tharu community. The party has picked Ram Krishna Regmi as its candidate for the chief of the rural municipality.